Q. How do I find my library card number? Your FIU One Card is your Library Card! You will need your FIU One Card to enter the Green Library. Study Room Reservations at FIU Libraries. Device Checkout from FIU Libraries. If you have an FIU OneCard, then you have a library number. It is the 14 digit number on the back of your student ID. 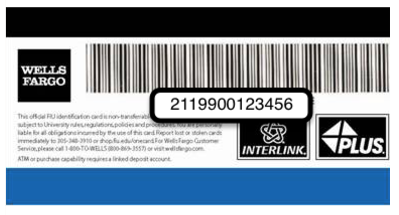 FIU Library Card numbers are automatically activated as part of the registration process (for students) and hiring process (for employees). Due to heavy workloads at the beginning of each semester, some delay in the record activation may occur. If this occurs and you need to use the library resources, please contact the Circulation Desk: BBC, 305-919-5718 & MMC, 305-348-2451; they are typically able to resolve activation problems over the phone. Additionally, you can stop by the Circulation Desk at either campus with your FIU One Card and activate your account in person. For new and transfer students -- Your library card will be valid from the first day of classes. For continuing students -- Your library card will be re-activated for each semester in conjunction with registering for class or dissertation research. Otherwise, your card is not valid. For Adjunct Faculty -- Your library card is valid for only the semester during which you are contracted to teach a class. Please contact your department if your library card fails to be re-activated; they will need to notify the Payroll Department of your continued employment. For Alumni and Retired Faculty -- Please retain your FIU One Card - it continues to serve as your library card.